Hello, stranger. It’s been too long. March came and went in a whirlwind of matches and moves, of showers and celebrations. Now – weeks later – I am finally sitting down to catch-up. And we have much catching-up to do. 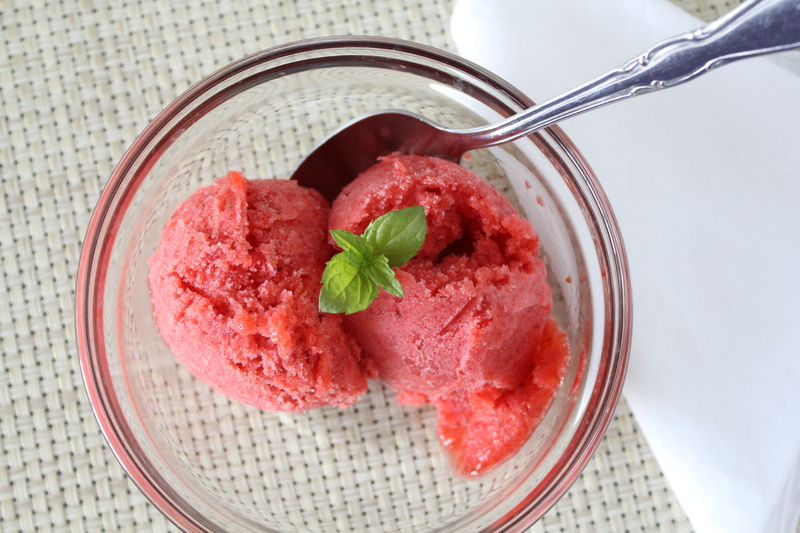 Let’s start with sorbet. Simply sweet, simply delicious, simply strawberry. In it’s most basic form it requires a mere four ingredients. If you’d like it a bit fancier, you could add one or two more. In any form, it’s a delicious dessert that reminds us that the simplicity of summer is not too far away. The recipe, as it appears in Lebovitz’ The Perfect Scoop, is written below. I double the recipe based on Annie’s suggestion and it was just the right amount for a party of 6 with a few servings leftover. 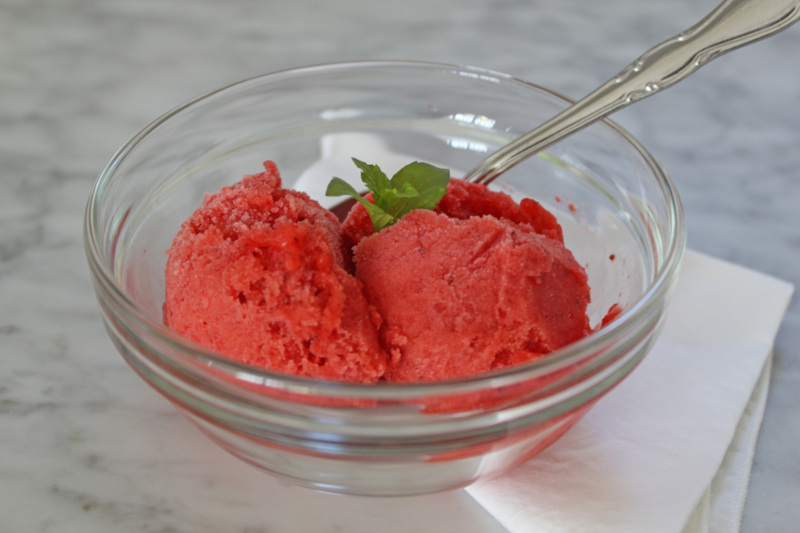 The sorbet was very sweet (I accidentally left out the salt) so I may decrease the amount of sugar just a bit next time I make it (or remember to add salt). I served mine with a mint sprig a top and it was a lovely accompaniment to the sweet strawberry. 1. Slice the strawberries and toss in a bowl with the sugar. Let macerate about 1 hour, stirring once or twice. 2. Puree strawberries and their juices, kirsch (if using), lemon juice and salt in a food processor or blender until smooth. 3. Chill thoroughly (at least two hours in the fridge, I like to chill overnight). Freeze in an ice-cream maker according to the manufacturer’s instructions.